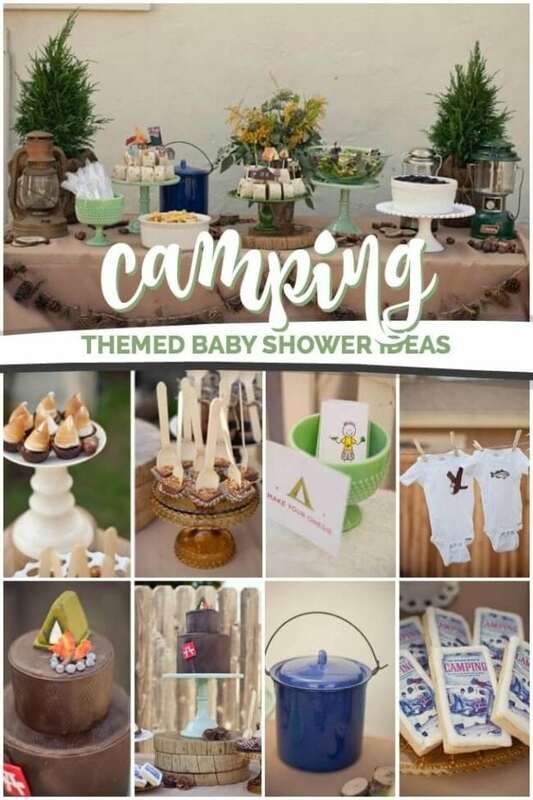 Imagine welcoming a baby boy-to-be with a rustic chic camping themed baby shower! 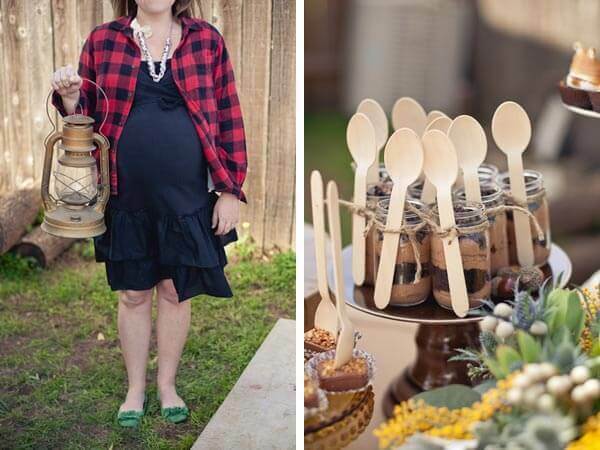 When your friend loves camping, it makes sense to take your baby shower vibe on a creative hike. Get ideas for decor with these 20 baby boy shower decoration ideas. Trying to choose a baby shower theme idea? 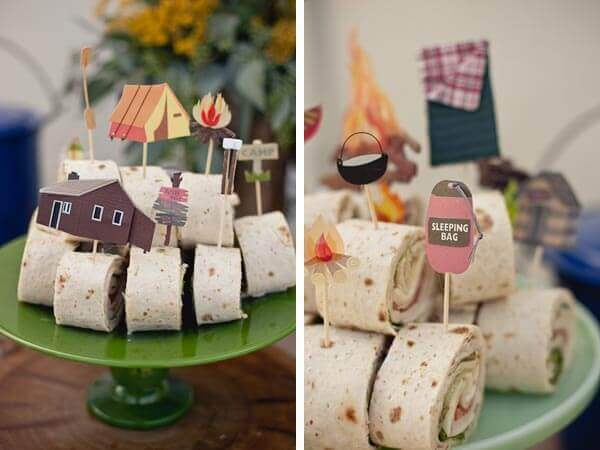 Check out these 34 awesome boy baby shower themes. We’re sharing our favorite campfire meals with you here. Jesi Haack Design, who has been featured here on our site before is no stranger to planning gorgeous events. With the talents of floral designer, JL Designs, and amazing dessert creator, Sweet and Saucy Shop, this baby shower really wows! 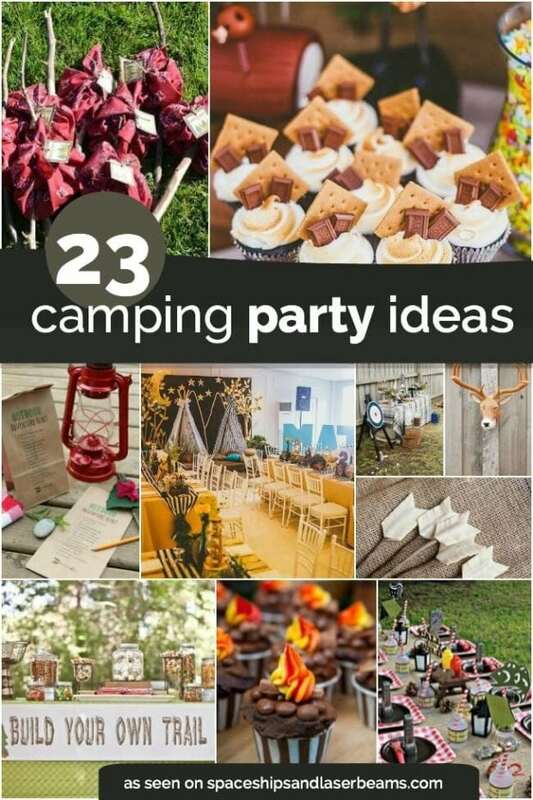 Whether you love camping or not, I’m pretty sure after viewing these incredible photos by Carlie Renee of Gabriel Ryan, you’ll be ready to head to the great outdoors to pitch your own tent! S’mores anyone? 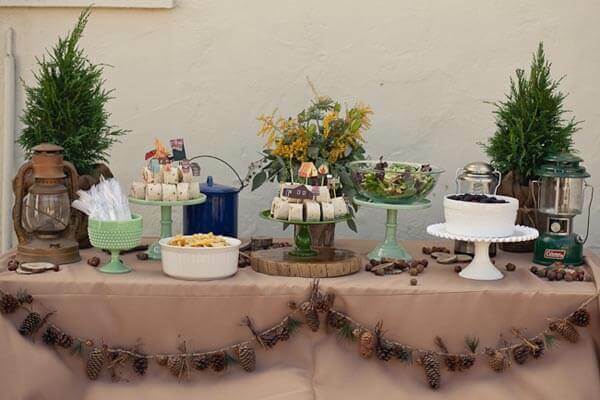 The dessert table was designed with so many inspiring outdoorsy touches, while keeping that rustic chic quality we all love. From the texture-rich pinecone garland to burlap-wrapped greenery, wood rounds and vintage style camping lanterns, the props in this shower were on point. 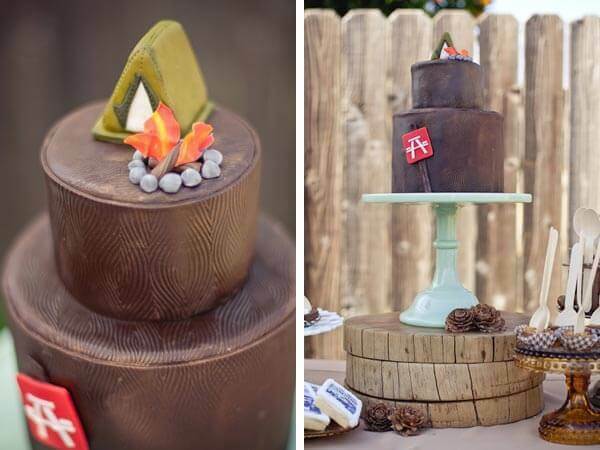 The gorgeous desserts perfectly fit in with the camping theme. They manage to look beautiful and theme perfect. The texture of the cake is impressive, reminiscent of wood grain. And how sweet is the cozy campfire and fondant tent topper…complete with stitches at the seams! 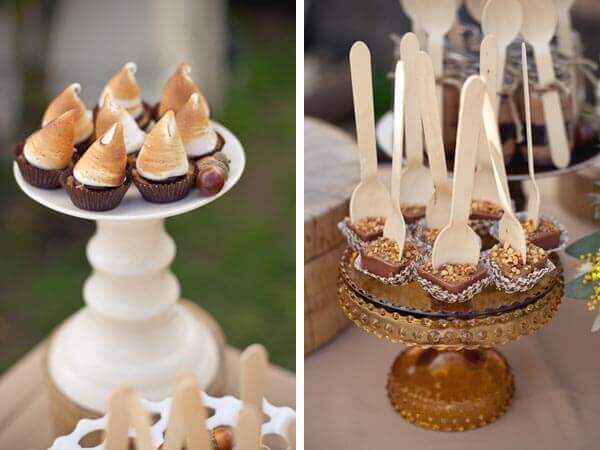 The toasted marshmallow topped mini cupcakes and layered mousse/cake jars look pretty amazing too. I love how wooden spoons are simply tied to each jar with twine. Other mini desserts were beautifully displayed as well, all thoughtfully complete with spoons, ready for eating. 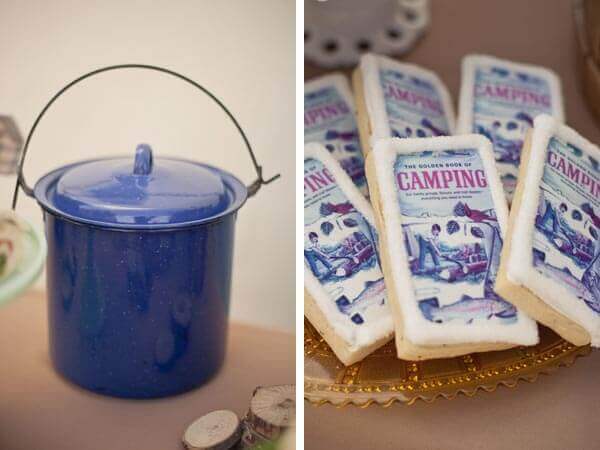 Gorgeous custom sugar cookies with a vintage camping motif rounded out the sweets. A luscious assortment of berries reminds of a pleasant afternoon of foraging in the woods. 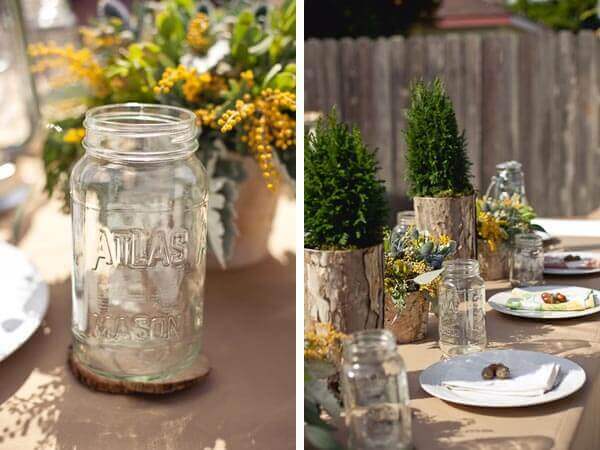 Bark vase centerpieces filled with miniature conifers, lush floral arrangements, and rustic lanterns gave guests the impression of dining in the woods. 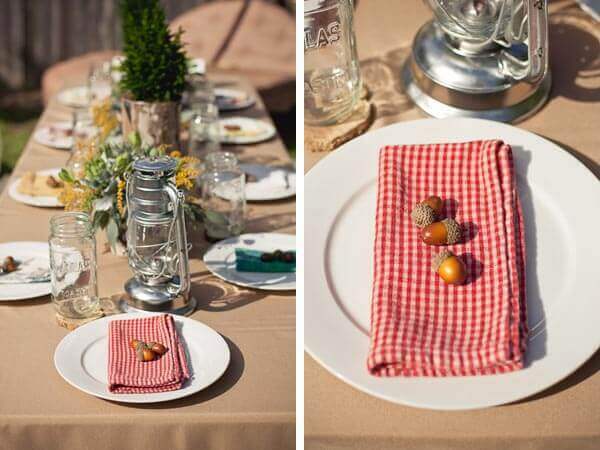 Place settings were kept simple with a collection of vintage napkins and a handful of polished acorns resting carefully on top. 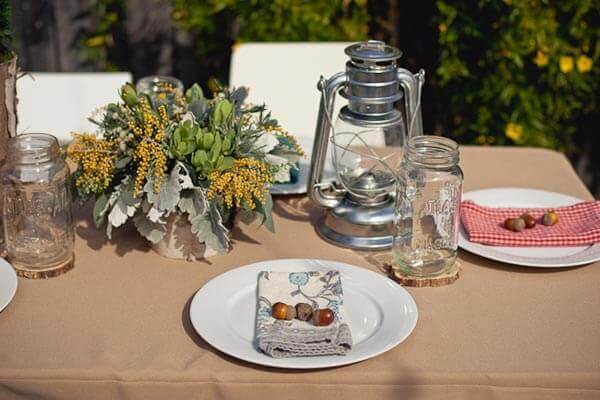 Mason jars were the perfect rustic choice for serving beverages on wood slice coasters. 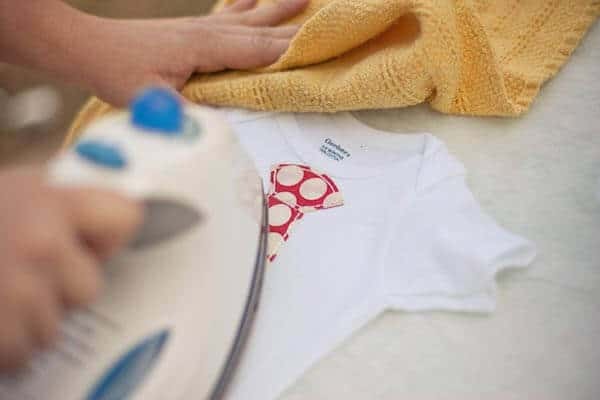 Set up as an all-inclusive activity station, guests were invited to make a onesie to gift the guest of honor. 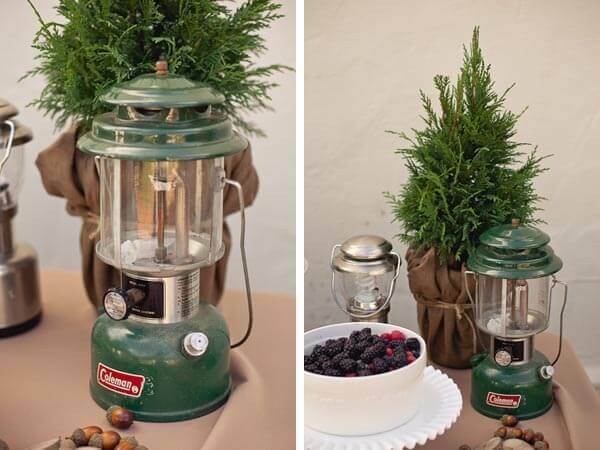 What a beautifully fresh idea to celebrate an outdoors woman and her new baby boy!